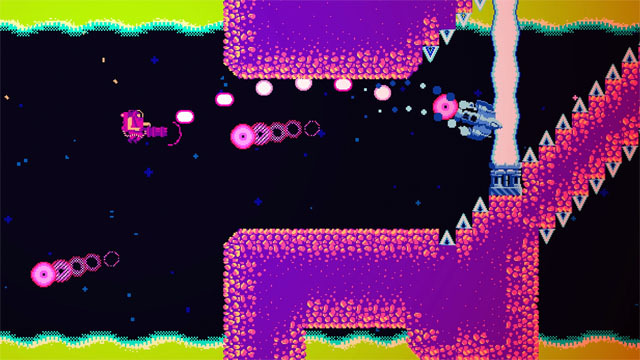 Taking a page out of the book of No Time to Explain, RunGunJumpGun from Thirty Three Games stars an action hero who uses his oversized weapon as an enemy-sploder and a bullet-propulsion system. The lone soldier must deal with enemies and dodge projectiles while keeping himself suspended over pits of spikes and lava in a post-apocalyptic world. The player must rapidly switch between firing forward and firing downward, and making a mistake sends him hurtling backward. Gamers will need fast reflexes and an incredible tolerance for high-contrast oversaturated mayhem flying at their meaty faces from all angles. The game is coming to PC, Mac, and Linux via Steam this summer, and it is also planned for mobile devices.